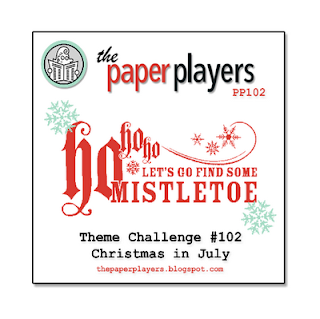 H2 Designs: The Paper Players Challenge #102 - Christmas In July! The Paper Players Challenge #102 - Christmas In July! Ann has this fun theme challenge for you, so pull out your Christmas papers & seasonal stamps, & come play along! I've stamped the lacy flower image with versamark, heat embossed with iridescent ice embossing powder, to get shine & sparkle, & then sponged the images with pool party ink to make the intricate design really pop! The sentiment has been stamped on a strip of cardstock & then I've inserted the strip in through the base of the modern label punch to get the fancy shape at either end. I've also made some matching mini "glimmer" brads (details at the end of the post). Hope you can join in the fun at The Paper Players! Hold the brad with a pair of long handled tweezers so you don't burn your fingers. Ink the head of the brad with white staz on ink. Once the staz on is dry, ink the brad with versamark ink, then your chosen ink colour (I used pool party), then dip the brad head straight into iridescent ice embossing powder. Ink the brad again with versamark, then your chosen ink colour & dip straight into iridescent ice embossing powder.